Travelling by boat in Myanmar can be a genuine alternative to the bus or train, connecting some major destinations and allowing visitors to get a real taste of life on the river; taking in sunsets over stupa-lined river banks; and mixing with the locals. The most popular routes follow the mighty Irrawaddy River (also spelt Ayeyarwady or Ayeyarwaddy), the backbone of Myanmar that flows north-south through the country, as well as various tributary rivers and routes in the Irrawaddy Delta, near Yangon. There are also several sea routes that follow the coast, connecting points that are difficult to reach over land, and the journey from Sittwe to the ancient capital of Mrauk U is usually done by boat. Please note that the map on this page indicates primary boat routes accessible to foreigners, not all boat routes. Boat trips can be provided by regular slow and fast boats that are used by locals, and generally cost between US$10 and $70, depending on the length of your journey; additionally, there are vastly more expensive cruises, which come with your own luxury cabin and five-star service (these are not regular transit and must be booked well in advance through a travel agent before you travel to Myanmar). Slow boats are the cheapest way to travel on water – and also where you come across most locals. On longer trips, you may have to sleep overnight on slow boats, sometimes on the floor – although some provide simple cabins. Fast boats are more expensive and only operate during the day – but, crucially, they allow you to cover distances more quickly and they are usually more comfortable. IWT (Inland Water Transit) is the government-owned company that provides most official river services. Their website provides a guide to services, and they have offices in most cities where you can get information and buy tickets; these are often located at or near the jetty from which boats depart. As with buses and trains, boats often leave very early in the morning. Some schedules are provided on this website in the entries for individual destinations around the country, but make sure to check the latest information when you get to Myanmar. Private boats irregularly serve some shorter-distance routes – for example, the beautiful Mawlamyine to Hpa An trip, that no longer has a government ferry service. But be aware that you are taking these at your own risk, as they are not regulated and can therefore be dangerous, particularly in the rainy season. As with so many forms of transport in Myanmar, it is important to note that river trips, particularly on slow ferries, can take far longer than publicised – particularly in the cool/dry season (roughly December to May), when water levels are low and boats can get stuck on sandbanks. On slow boats you will be travelling with many locals – usually foreigners are lucky enough to be given small plastic chairs. Unless you have a cabin, it is a good idea to take warm clothes and something soft to sleep on if you are anticipating being on your boat overnight. And you can expect the toilets to be foul – although they are better on fast boats. Monks will often have their own separate compartments on boats. Connecting two of Myanmar’s biggest tourist spots, this is the most popular boat journey in the country, taking in a the expanses of the Irrawaddy River (up to two kilometres wide at some points), and sometimes including interesting stops at riverside villages, where you will get to see village life and have the opportunity to buy fresh local produce. This boat journey also avoids the alternatives of a rough road or a sometimes crowded train journey or uneventful bus journey. Depending on whether you choose the fast or slow boat, the trip lasts between ten hours and two days. Negotiating the Irrawaddy’s treacherous sand banks requires a skilled pilot, and in the dry season (December to May) boats sometimes get stuck – do not take the slow boat if you are in a hurry! For a collection of photos from the Mandalay to Bagan river journey, go to our Flickr photo set. To make an online booking for the Mandalay to Bagan by boat or find out more about service times, go to Bagan. For the truly adventurous, a boat journey in the far north of Myanmar is an experience like no other. You will need plenty of time, but the journey from Myitkyina, Bhamo or Katha southwards down the Irrawaddy is a rewarding trip, far off the normal tourist trail. It is best undertaken as a loop, first taking a plane or the train journey northwards from Mandalay (go to getting around Myanmar for more information); on such a long journey, it is advisable to go with the (southwards) flow of the river. 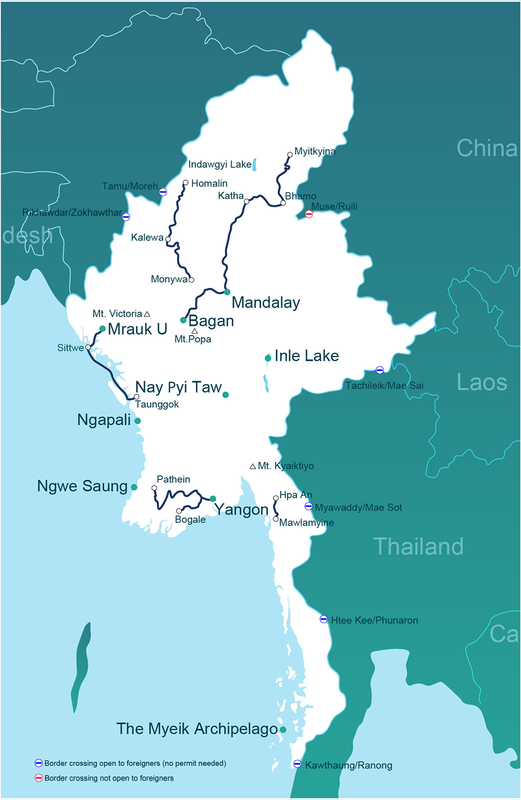 Note that due to the security situation in northern Myanmar, the section from Myitkyina to Bhamo is currently restricted; it is possible to combine different sections of this route with boat and rail travel. Boat travel that is less commonly frequented by tourists can be found all around Myanmar. From Yangon, there is a daily boat through the vast Irrawaddy Delta to Bogale and the amazing Meinmahla Kyun Wildlife Sanctuary. At Indawgyi Lake, a boat can be hired to cross or simply cruise around Myanmar's largest body of water. In Dawei, you can hire a boat and crew to go offshore fishing or explore the paradisal and uninhabited Moscos Islands. For an elegant, though pricey, retreat, tour the Myeik Archipelago by sailboat or yacht. Sailing excursions can also be hired from the port town of Myeik. Small boats are sometimes used to sidestep roads in poor condition, for passage in lieu of a bridge or simply for an afternoon of leisure on the water. If confronted by a body of water and the question of whether marine navigation is possible, just ask! To find out about boats to specific places around the country, go to destinations.